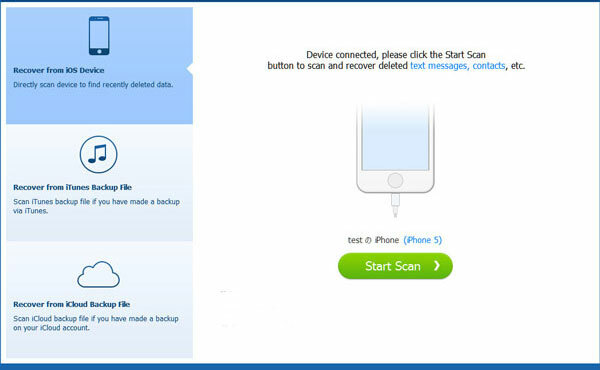 Mistakenly deleted important data from your iPhone, iPad or iPod touch? Don't worry, MobiKin Doctor for iOS is here to help you restore deleted, lost or formatted data from iDevices on Windows system. Data losing happens here and there in the digital portable life. So as an iDevice user, we strongly recommend you to find a data recovery program for your iPhone, iPad or iPod touch as your daily assistant. 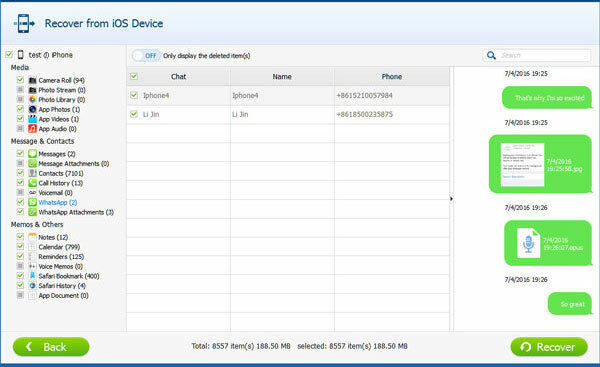 MobiKin Doctor for iOS is just the tool that can provide users with three different recovery modes to find back the deleted, lost or formatted contacts, SMS, photos and more. Recover data from iDevice directly without iTunes backup: Simply connect your iPhone, iPad or iPod touch to computer with a USB cable, then the program will help get back all your lost or deleted data from the iDevice directly. Restore data from iTunes backup easily: There is no need to open your iTunes or connect your device to the computer. The program can auto-scan all iTunes backup files on the computer, and you only need to find the one for your iDevice and continue to extract any data you want from the backup file. Retrieve data from iCloud backup effortlessly: You just need to select the Restore from iCloud Backup File mode and then log in iCloud with your Apple ID and password then you can easily preview and get back your wanted data. The types of files on your iPhone, iPad or iPod is definitely different. In order to satisfy your different recovery needs, this program will supports more than 10 types of files without limitation. So that you can use it to restore any data as you like. Messages, Contacts and Call History can be restored and saved as HTML or CSV format. Compatible with all generations of iDevices, including the latest iPhone X, iPhone 8/8 Plus, iPhone 7/7 Plus, iPhone 6/Plus, iPhone 5S/5C, iPhone SE, iPhone 5, iPad Air, the new iPad, iPad 2, iPod touch, iPod nano, iPod shuffle, etc. You're also enabled to extract data from unreadable iTunes or iCloud backup file and save them on your local computer. But here please be sure that your iTunes/iCloud backup is the latest one and contains all files you need. System update: iOS 11/10/9 update or downgrade erased all your data. Users of MobiKin Doctor for iOS Have Surpassed 740,000+ Worldwide. After upgrading and updating - all old iPhone data lost for last 18 mos!! - Got it all back via iTunes restore - Thank you! And I have recommend this program to all my friends who have the same needs as me. Keep moving, guys! Method 3. 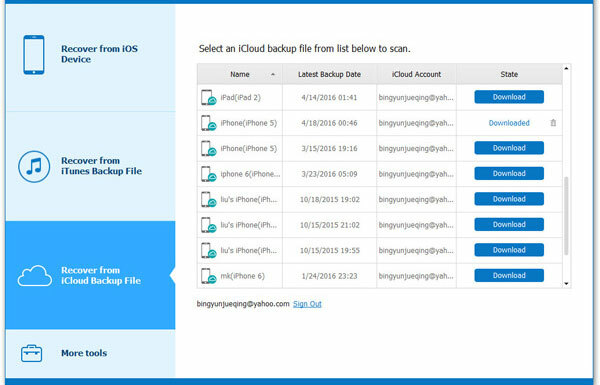 Retrieve deleted files from iCloud backup files without any hassle. Now, let's to check the detailed steps of these methods. First of all, you need to install the program on your computer. It is a common situation that you found something important on your iDevice is lost, and you have no backup files on your desktop computer, then you need to ask help from MobiKin Doctor for iOS to get back the deleted contacts, SMS, call history, notes, calendar, reminders, voice memos, photos, safari bookmarks, etc. from iPhone X/8/8 Plus, iPhone 7/7 Plus, iPhone 6/6S, iPhone 6S Plus, iPhone SE, iPhone 5S/5C/5, iPhone 4S/4, iPhone 3GS, iPad Air, the new iPad, iPad 4/2, iPod touch/nano/shuffle, iPod classic, etc. What's more, you can also use the program to scan and rescue the SMS attachments on your iDevice. Note: Please stop using your device once the data losing have happened. Run the program on your computer, then, link your device to the computer, here we will take the iPhone as an example. After the connection, you need to click "Start Scan" to begin the scanning process. After the scan, all the files on your phone will be listed in categories. Here you can click the different folders in the left panel and you'll get the corresponding contents in the right panel. Text contents like contacts, messages, notes, reminders, etc. will be shown in the list view mode. And all detailed contents will be included in the scanning results. Media contents like photos, camera roll, SMS attachments, etc. will be displayed in the Thumbnail view mode. You can go through these shortcut to locate your target files quickly. Mark all data you want to restore, and then hit "Recover" button to save them on your computer very well. Sometimes you may lose data due to virus attack, phone stolen/broken, or many other reasons, then you have no device at hands for restoring, so here you can choose the way of restoring lost data from iTunes backup files. After launching the program on your computer, you can directly choose "Recover from iTunes Backup File" on the top menu. Then all iTunes backup files of your iPhone, iPad and iPod which has ever synced with iTunes on this computer will be automatically found and listed. Select the one you want and click "Start Scan" button to get the data displayed in the program. After scanning, you can preview the listed files on the program and then check the wanted files and tap on "Recover" to get back your data. 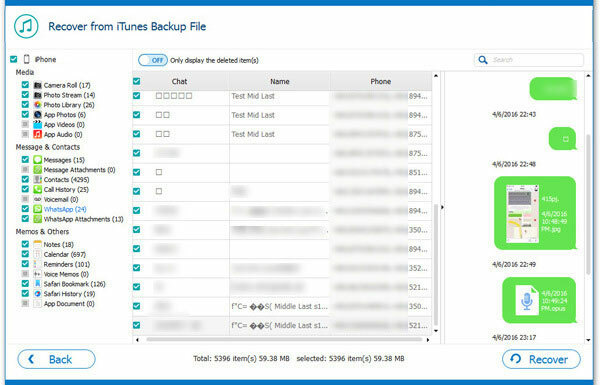 Also, the first step is to choose the mode "Recover from iCloud Backup File". Then you will be asked to log in iCloud with your Apple ID and passcode. 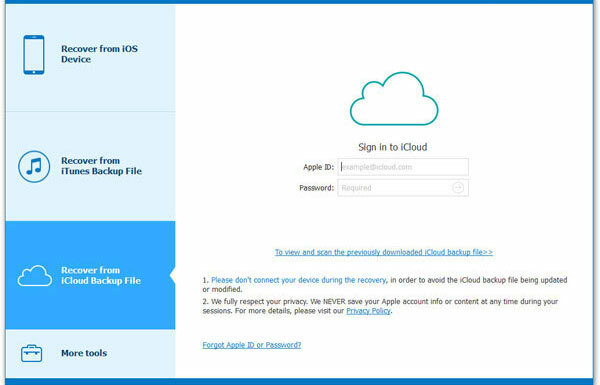 After entering the iCloud, you are able to preview and recover the desired files by following the Step 2 in Method 2.
iPhone X, iPhone 8 Plus, iPhone 8, iPhone 7 Plus, iPhone 7, iPhone 6s Plus, iPhone 6s, iPhone 6, iPhone 6 Plus, iPhone 5s, iPhone 5c, iPhone 5, etc.